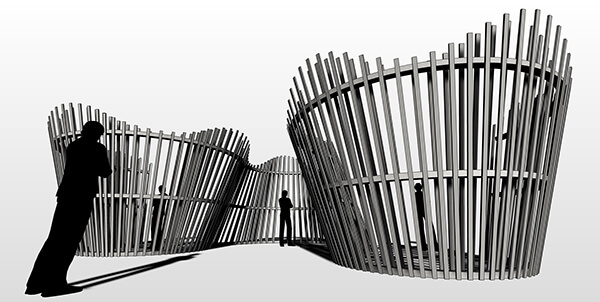 In this course, Brandon Gibbs walks you through the deconstruction of the Serpentine Wall. Brandon worked on this project while working at McCown Design. Brandon has a foundation at the Architectural Association with Patrik Schumacher of ZHA and Theo Spyropoulos of Minimaforms, and has continued to explore parametric design methods in architecture. This course focusses on the whole workflow from design to standardizing to fabrication. It’s a great introduction of how to use parametric methods using Rhinoceros 3d and Grasshopper. You’ll learn how to apply these methods not just in design, but most importantly in the construction, documentation and fabrication process. Brandon starts by explaining the notion of Parametric Design with some examples found in nature and the possible applications in design. The input for the wall will be a set of curves that will drive most of the generation of the individual members. After setting up the creation of the various slats and rails which are controlled with a set of variables, Brandon explains how to add fabrication and construction constraints, like tolerances and additional extension lengths. To explain how to add a generative element to the wall, Brandon uses the sine formula to influence the different member lengths. In the final part of the course, Brandon will show some common practices to keep your definition clean. This is especially helpful when revisiting old definitions. When using your design and 3d model for fabrication purposes, a standardization step must be included to account for construction demands and constraints. Brandon explains the importance of this and shows how to standardize the various elements of the wall before exporting. In the last step of the course, Brandon will show you a simple method to document important information about the wall to Microsoft Excel.